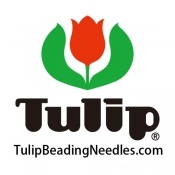 Tulip cellulose - head pins are available in yellow tulip shape or autumn momiji (maple leaf) shape as thin as a size 13 quilting needle (0.55mm) or pink tulip shape finer than a size 10 beading needle (0.45mm). They are smooth with nickel-plating and a straight sharp point. In Japan, 4th grade students are presented with a handsewing kit. Within the handsewing kit is a tulip cellulose - head pin. The children are asked to write their name on their pin. This teaches them to value even the tiniest of tools. You too will value these durable, strong and sharp headpins. The Patchwork pins feature a small round glass head on a 35mm length pin.